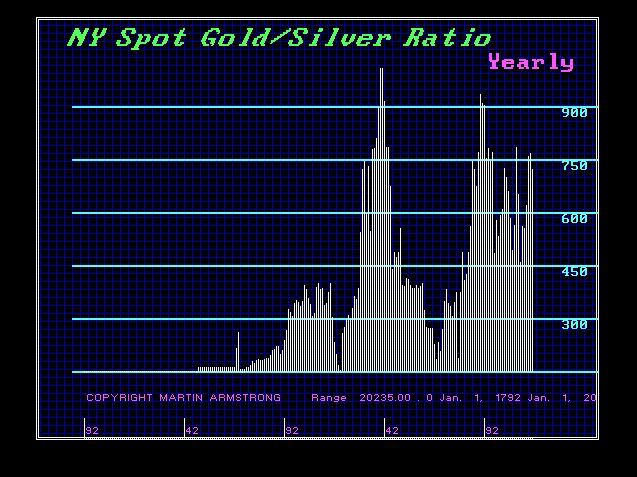 QUESTION: Dear Mr. Armstrong, Is silver currently showing more strength than gold, and therefore likely to move beyond gold in this phase? I’m not a technician but it looks that way to me. ANSWER: Yes. This is one of the critical factors that must turn to signal a real bull run is coming. We did elect a Weekly Bullish in silver on Friday but not gold. However, we did get a Minor Monthly Bullish at the close of 2016 both in gold and silver. For a real bull market, we need the silver/gold ratio to break 60:1. It is currently in the 69:1 range. Here is a chart with 200 years of data for this ratio. A bull market requires BOTH metals to rally. Gold may have more trouble since it is being tracked by all governments. You cannot mail it outside the country nor jump on a plane with 10 ounces. Silver may become more viable if the world actually moves to electronic currency. So this ratio should start to come in after 2017. All the hype about demand and who is buying or not, is just irrelevant. The key factor for every MAJOR rally is bringing in the general public. The people who follow metals religiously really do not count for much. They simply make rallies and declines in the short-term. It is when you convince the general public to rush in and buy because they are suddenly concerned about the government, the banks, or even the currency collapsing. I have stated many times, that QE would not be inflationary because they were buying in bonds that were not necessarily in domestic hands. China sold their long-term holding and shifted maturities to 5 years or less and the money flowed to China not domestically. 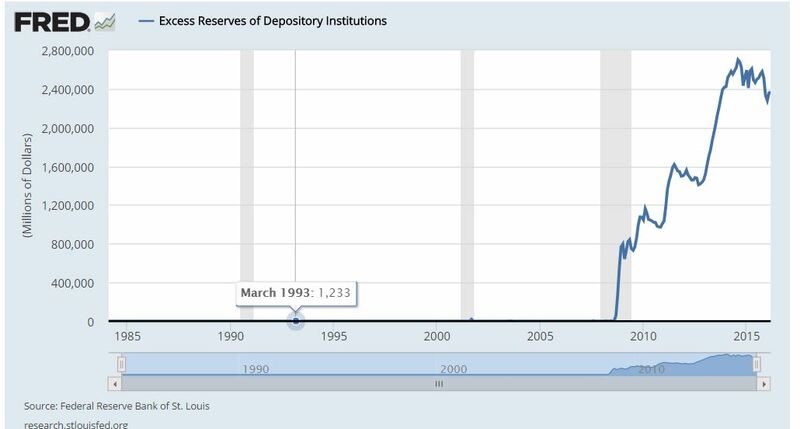 Then the banks complained they had no place to park money so the Fed created Excessive Reserves that reached almost $2.8 trillion. So the money they presumably pumped into the economy never made it. The banks still parked it at the Fed instead of bonds. Creating excess reserves defeated the entire idea of stimulus. I cannot contemplate how anyone capable of rational thought would assume this would be inflationary. The Fed bought the bonds, the bank then handed the cash back to the Fed and then the Fed paid them interest. If anyone can explain why you would think you injected money into the system when it never left the Fed? Sometime just reading headlines only indoctrinates people into the BS government wants you to think.